After a super supper at the local restaurant, “È n’ata Cosa” (cda santa caterina, 82027 Pontelandolfo), we drove into town. Oops, I need to pause the story for a second. All the foodies are wondering what we ate and how much we spent. Thinking it would be a light food night, while reading the menu, we started with a dish of olives and a bottle of the local Aglianico wine. Our thought of sharing a simple pizza margherita was abruptly erased. The waitress described the “frutta del mar” – mussels, clams, calamari, other fish I can’t remember, oil and garlic – and we too were hooked. Both of us ordered the seafood on linguine and were not disappointed. We added salad and a bottle of aqua frizzante to round out the meal. Oh the cost – only 30 euros. That is about 40 bucks for lots of fresh seafood, a bottle of great wine and more. 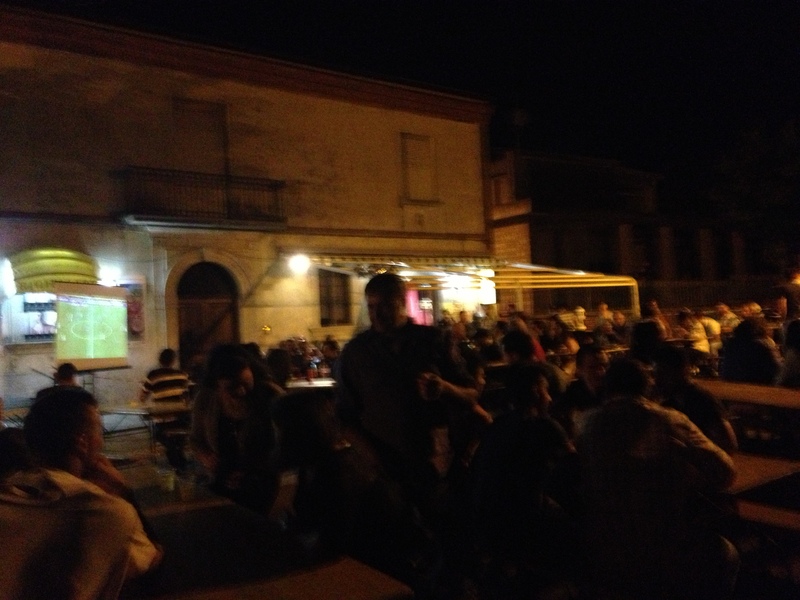 Back to the story, We wandered down towards Piazza Roma for an after dinner drink or two at one of the outdoor bars. We love sitting outside and people watching. We only grasp about 20% of the conversations – mostly spoken in dialect – but it is great fun to play Harriet the Spy and listen in on the plots and twists of everyday life. Oops, Jack just looked over my shoulder and “ahhemed” – OK, OK, I’ll drop the papal “we”, I’m the only one that eavesdrops on folks. We drove into town chatting away about the great meal when blinking lights and a temporary fence barred the way. Whoa – a police barricade had closed off access to the piazza. We screeched to a halt, were detoured to a one way street and wondered what was happening. Screams and shouts could be heard through our closed car windows. Was that fear? Could something heinous be happening. I looked at Jack and knew we had to get closer and find out what was going on. He looked at me with that “are you pazzo?” expression. We parked near the town recycling bins – far enough away to be safe and close enough to hear the sounds. The screams turned into a wail – the piteous kind of forlorn wail that could only mean one possible thing in a small Italian town – some evil team scored a goal against Italy. Out the dark came the shouts of fans. We rounded the corner and could see a movie screen set up in front of Bar 2000. The street was closed off, picnic tables filled the street and about a hundred people were gathered watching a calcio match of Italy versus Brazil. What a great marketing strategy for the bar! I asked my cousin if the town charged the bars for closing the street – a potential additional income stream. She didn’t think so. Then I remembered I had to stop thinking like an American. People of all ages from babies in strollers to great grandads were enjoying the cool night air together. All the town had to do was put up a fence and a community event could be created. Picnic tables in the street. We watched for a moment or two and walked the half a block to the next bar. There, a flat screen TV was perched on an outdoor bar tuned to the same game. A smaller but no less vocal crowd watched the game – or is that a match? We stood there for a while too, adding our cheers, jeers and sighs to the sounds of the crowd. Just a typical night in a small Italian village. Next postCell Phones – Can’t Leave Home Without Them! I literally cannot wait until July! OK…I AM pazza! What’s CALCIO?? Whatever it is, I wanna be there! Soccer! They closed the streets so that everyone could gather around big screens and watch Italy play Brazil in a soccer match. Pretty cool! Don’t leave us in suspense…who the hell won the match? Brazil! I was enjoying people watching and not watching the match. Brazil 4 – 2. Rich and once stopped in a Portuguese bar and got involved in a soccer match..lots of fun (in the USA!!). Rich officially ends his work career on Fri. June 28. Lots of nerves but I know we will have a delightful time figuring out what to do next. Your blog has been an inspiration. Unfortunately neither of us have any relatives (we know of!) overseas. Maybe we should just come and visit you! !